NEW DATES: NDAFW will be January 21-26, 2020. Registration opens at the end of August. 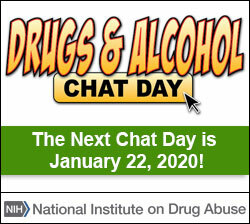 National Drugs & Alcohol Chat Day will be held on Wednesday, January 22, 2020. NOTE: NIDA materials and resources can be used for educational events or classroom activities any day of the year! 1,918 events were registered for 2019! We could not have done National Drug and Alcohol Facts Week® (NDAFW) without you. You are AWESOME! 2019 Registration is now closed but will reopen for NDAFW 2020 in August. NIDA would love to see your NDAFW images. Please include a Release form with any photographs, audio files or videos that you share with NIDA. Thank you for joining us for this year's Chat Day. We had 44 schools participating and nearly 4,500 questions submitted. We answered as many as we could. See the transcript to see if your questions were answered. See the 2019 Chat Day Transcript! 2018 GRAMMY Foundation® and MusiCares® Teens Make Music Contest Winners Announced. NDAFW is a national health observance linking teens to science-based facts to SHATTER THE MYTHS® about drugs! Your participation truly matters and has helped us grow. Register your event or promotional activity and we can help you plan it. We can also tell you how to order free science-based materials for teens. Then, let us know how it went so others can be inspired. Learn about NDAFW, then use this online guide which gives you everything you need to plan, promote, and host your NDAFW event. Register your event now and receive free booklets and other resources for teens. To get activity ideas and toolkits, click here. Also, keep checking our Highlights from NDAFW Events section to see highlights from what event holders are doing for NDAFW. 1,918 events registered for 2019! !